just like everybody else, i am getting organized for the year. here are my calendar choices for 2014. 1. kraft wall calendar for my studio. i see so much color everyday i try to keep things nice and simple on the walls – and when i finally paint the walls from the horrible blue and green to white this year the kraft calendar will look that much better. i also have the kraft background on my studio computer. 2. patterned wall calendar for my home. this will go in the kitchen and the colors will add just the right pop to my white walls and yellow countertops. to go with the calendar i have the patterned background on my computer at home. 3. monthly planner for keeping track of bills. this is the perfect size to record bills i need to pay and money coming in. if it is an actual bill i clip it in and write the amount on the date and all other bills i just mark the date and amount. 4. kraft monthly sheets for projects. i have been using this type of calendar for years. i am happy to see that these sheets and the spiral version has taken off so well. these calendars and the sheet next to them are so great for planning large projects with lots of little deadlines. when something overwhelming is coming up being able to make a task list and then mapping them out week by week makes a huge difference. i use them with a binder so any relevant paper work or more sketching pages can easily be added and taken out. 5. a travel notebook for daily lists. almost everyday i start the day off with making a list of what needs to get done. i thought about using the weekly planner this year, but i like the flexibility of a notebook right now. for anything i schedule months in advance that i can’t forget (like the dentist) i add those right to my phone and make sure it emails me a day or two before. what’s your favorite way to get organized? 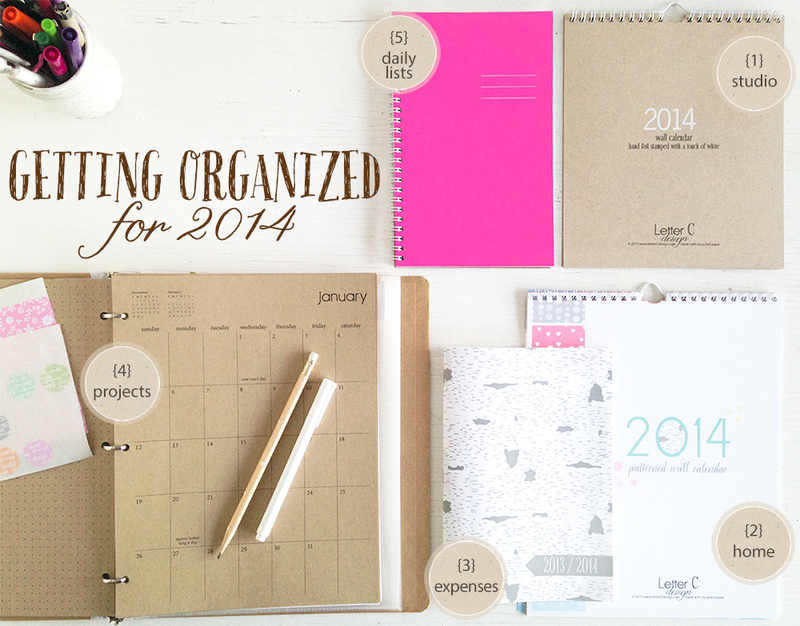 i love hearing how people use their calendar and planner and getting suggestions for new styles. i know for sure that there will be an extra large kraft calendar offered next year – i think at least once a week someone asks for one.